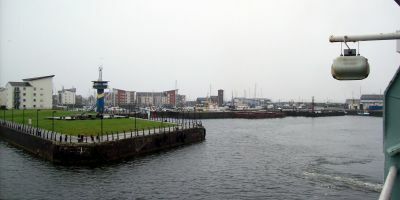 Clyde Marina sits in the heart of Ardrossan, with 250 water berths fully serviced by water and power. The toilet and shower block is open 24 hours a day. Reception is manned during office hours, then from 5pm to 11pm a harbour master is on duty to assist clients, alongside 24 hour security. Clyde Marina has secure keycard access for berth holders with key code access for visitors, with extensive parking and a free laundry room. Diesel available from 9am to 11pm, petrol available from filling station 100m away 24 hours, and the marina can be approached at any tide, visit the Clyde Marina web site to familiarise yourself with the traffic light system for entering the marina in accordance with the Arran Ferry and also if in bad weather the storm gate is closed. Ardrossan began in the 1200’s with the construction of the castle ‘Cannon Hill’. One of the Barons who lived in the castle was in league with the Devil, according to public rumour at the time. Oliver Cromwell eventually ordered the Castle destroyed in 1648, but the ruins still stand in an unstable way. The town became a centre for shipbuilding due to the exportation of Coal and Pig Iron to Europe at the time. Ardrossan fell under hard times when the yards closed down in the 1950’s, but started to redevelop in 2001 thanks to the marina. 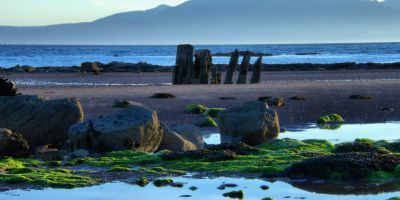 Today, Ardrossan stands as a beautiful resort town on the headland of North Ayrshire. Many features of the towns history can be seen as one walks around, converted for modern use on the inside. The old dockyard became an Italian restaurant and the town itself is largely reformed. Castle Hill, known as ‘Cannon Hill’ to the locals, is an excellent place to visit and picnic. 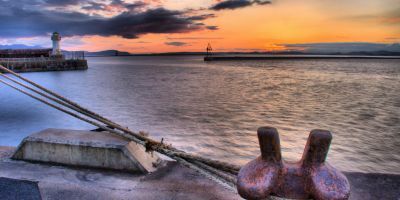 The area includes a great swing park for kids, beautiful views over the town and bay along with the nearby ruins of the old Castle that can be seen from almost anywhere in town. The Southern End of town continues to be stylish and quiet, proving a popular destination along with the South Bay sand beach. The beach is quite large, and above the seawall lies a huge area of flat grassland for families to sit. A war memorial can be found here too. 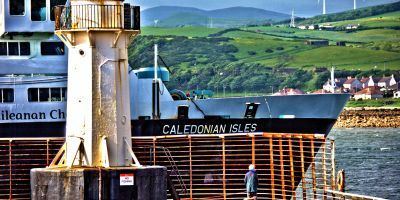 The nearby towns of Saltcoats and Stevenston are so entwined with Ardrossan, it’s almost impossible to tell when one begins and the other ends. However, just to the South East of Stevenson lies a miniature golf course, which is amazing fun for the family. The Auchenharvie Golf course also sits just to the West of the miniature, for those without children. As far as food goes, the aforementioned Italian Restaurant, Cecchinis, offers excellent food and great views over the bay. Wait times are usually no longer than ten minutes, even though the restaurant is always busy, and the prices are well thought out. An alternative is Garfield’s Tapas Bar, a beautiful atmospheric bar that usually has live music too. The food is great and they fully support all vegetarian options. The staff are friendly and it’s not uncommon to see the owners come out and talk to their patrons. The bar itself is light, airy and expertly furnished. Long / Latitude: N 55° 37' 59" W -4° 49' 8"
Glasgow Prestwick Airport lies the closest to Ardrossan. A flight there will leave you with train, car and coach journeys available. 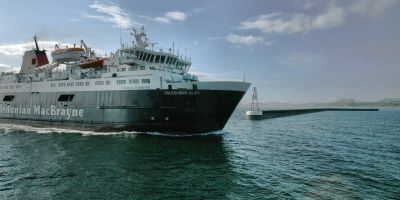 The train from Glasgow Prestwick Airport will take around 40 minutes with one change. Alternatively, the train is available from Glasgow too and will take around the same amount of time with no changes. Coaches are available from both Glasgow and Glasgow Prestwick. (See online for times and prices.) If you're after a taxi, you can call Mainland Taxis on 01294 463556. The car journey from Glasgow Prestwick will take around 25 minutes via the A78 or from Glasgow central, the A737 will take 50 minutes.